Ink'd Wings: Black & White & Splash! The great challenge at Our Creative Corner this week is to create a black and white card with a 'splash' of color. The embossing folder is from Cuttlebug, dies are from Spellbinders and Sizzix. The red paper was sprayed with a gold mist before embossing and cutting. Stickles were used to highlight the flower and the leaves. Beautiful embossing and die work. Wonderful Marie! My first thought was that your black panel looked like vintage metal; very pretty. Your glittery rose looks marvelous front and center!! Fabulous card! It's a beautiful colours combination. I love the delicate and elegant cards. Thanks so much for sharing with us at Out Creative Corner this week. Okay, I am speechless!! WOW simply stunning my friend. Wow, this is totally terrific. What wonderful textures with just the right amounts of B/W and lovely red. 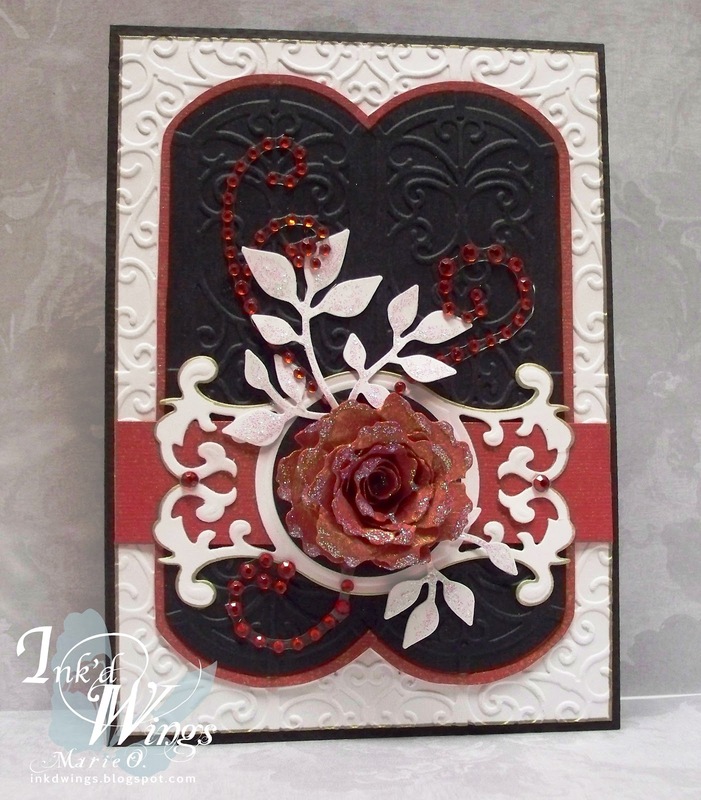 Your flower is sensational too - did you make it with a Spellbinders die? I just love handmade flowers! Always great to have you joining in the fun with us at Our Creative Corner! Oh my goodness, this is a right stunner Marie .... I love your background textures and sparkles and wow... fabulous flower too! So glad to have your join us this week at Our Creative Corner!!! WOW, this is stunning! I LOVE the flower and all the lovely textures! Wonderful sparkle! Thanks for joining us at Our Creative Corner!